Simple, beautiful and festive salad made with Quinoa, pomegranate seeds, tangerine segments, and topped with a delicious homemade Cranberry-Pomegranate Vinaigrette. Ummmmm. Are you seeing a pattern here? I’m a teeny-weeny bit obsessed with quinoa. Okay, a lot. I can’t help it! It’s SO! GOOD! Also, remember when I said that I was keeping all the fresh spinach for my salads? Well, here is the salad, except there’s no spinach in it. I used up the spinach and made my awesome Spinach and Artichoke Dip Pizza, instead! Far cry from that diet I was talkin’ about. 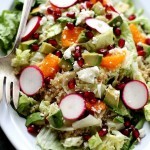 But to counter that drool worthy pizza, I made this Pomegranate and Citrus Quinoa Salad the following day. Balance, people…that’s where it’s at. So this is my new favorite quinoa salad. It is my way of taking my quinoa-obsession up a notch. By boiling it in chicken broth instead of water. YEAH! That is some gooooood stuff! I am shouting as if I invented this method, however I had always made my quinoa with water, trying to save me some calories for all the toppings I would add to it, but this time around I really wanted something different, and different is what I got. Different and damn good! This is my new favorite quinoa recipe and it will be my favorite quinoa recipe until I try my next new favorite quinoa recipe! Besides, this is a lot more exciting than the usual lighter-meals that I eat – cereal, water and berries. OH! And let’s not forget about the dressing! You are going to LOVE it! Cran juice, pom juice, pom seeds… it’s just plain amazing. I drank it straight from the jar then I remembered to add it to our salad. Don’t judge… you’re going to do the same thing. Nevah say nevah! Combine all ingredients in a jar/cup with a lid; shake well and let stand. Combine quinoa and broth in a saucepan and bring mixture to a boil. Lower heat, cover and simmer for 15 minutes; remove from heat and let cool. Layer shredded lettuce on a large plate. Layer cooled quinoa on top of salad. Add tangerine, avocado and sliced radishes. Sprinkle feta cheese and pomegranate seeds. 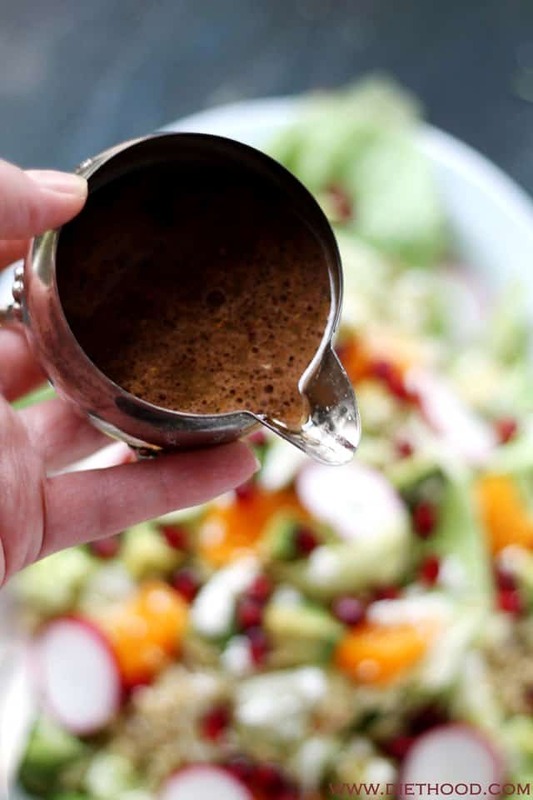 Shake or mix the salad dressing very well and add desired amount to salad. *Refrigerate any remaining salad dressing and leftovers. Looking for more Quinoa Recipes? See below! I LOVE this salad! Three of my favorite ingredients… pom, citrus and quinoa. We are obsessing on pomegranates this season, and I’m certain this will be a hit for my husband. MIght even make the Christmas table!! Big hit at the company x-mas party, sending them to this page for the recipe. That is all kinds of awesome!! Very glad you all enjoyed this salad. Thank you SO much for letting me know! Merry Christmas and Happy Holidays! A Pudbudder Holiday | Pudbudder - It's all about fun! I’m not obsessed with quinoa (that whole unfurled prophylactic thing stops me in my tracks) but this salad looks terrific–I love the colors and flavor combo and of course it uses both radishes from my farm share (occupying space in my fridge) and citrus from the band fruit fundraiser cases in the breakfast nook! In such a pretty way. That dressing sounds amazing and the salad so vibrant with colors and flavors! Now that’s a beautiful salad! 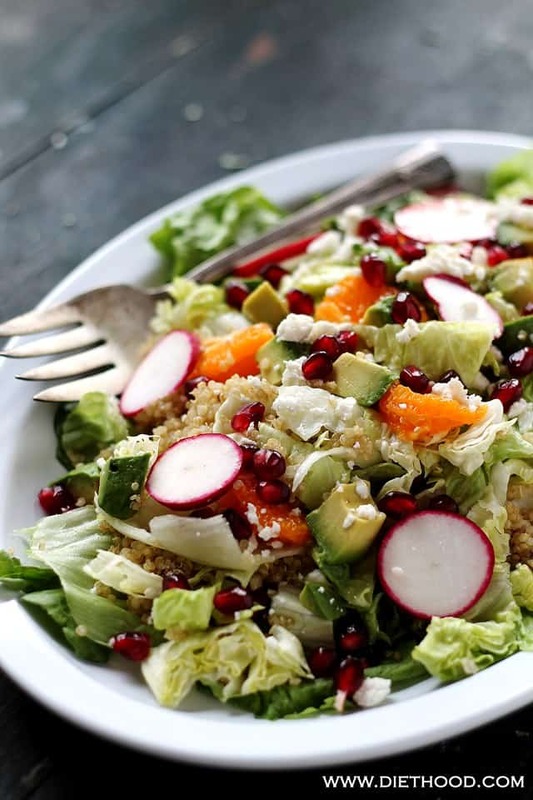 Great selection of ingredients and love the addition of the quinoa because it’s a full meal. And you’re right – that dressing is usual and sounds delicious! Quinoa is too easy to get obsessed with. This is such a beautiful salad and surely delicious too! This is VERY beautiful, Kate! 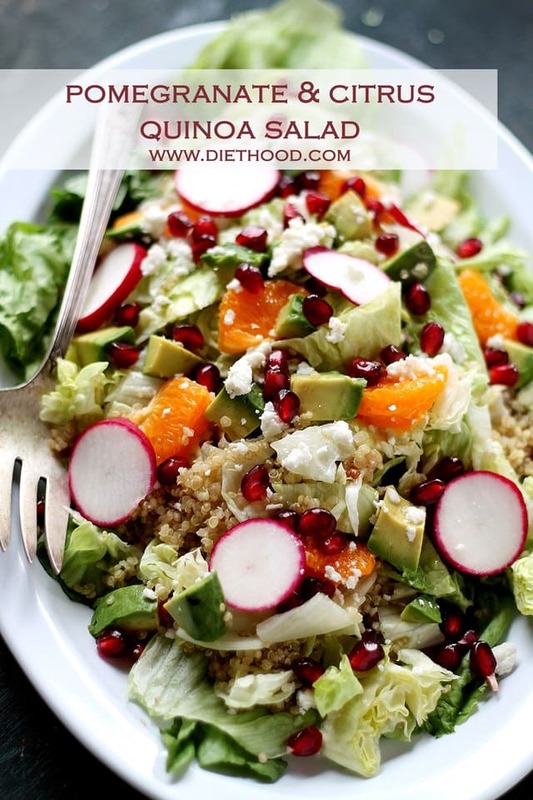 Love your cranberry & pomegranate based dressing! This is a wonderful salad for a holiday party! I eat salads practically everyday and this salad has all my favorite ingredients. Love the beautiful vibrant colors! This will be a go to salad for a while. Thanks Katerina! I’m totally joining you on the quinoa bandwagon, my friend. I love the stuff too. I’m not sure if I’ve ever made it with chicken broth instead of water or not, but now I’m going to try. See, you’re ruining my diet too. But, I’ll balance that by putting the quinoa in that salad and making that dressing. Both look amazing. This salad has so many great textures! I know this would be a big hit for me. 🙂 This will be lunch tomorrow. P. S. – I love avocados!! Gorgeous, I love pom and citrus in winter salads!